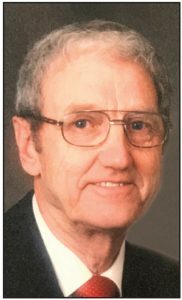 Russell Jay West, beloved husband of Hazel West, passed away in Taber on Friday, January 4, 2019 at the age of 97 years. A private burial will be held at the Taber Memorial Garden prior to the memorial service. The Memorial Service to honour Russell will be held at The Church of Jesus Christ of Latter-day Saints, Taber Stake Centre, 4709 – 50 Avenue, Taber on Friday, January 11, 2019 at 11:00 AM. After the service, family and friends are invited for lunch and fellowship in the cultural hall of the church. Condolences may be forwarded by visiting our website at http://www.southlandfuneral.com. He is survived by his wife Hazel West and sister Janice (nee West) Shaw. Russell will be loved and missed by his children Jean Braun of Taber, Vicki (Marvin) Clifton of Calgary, Robert and Linda (nee Sorgard) West of Taber, Beverly West of Calgary and Bruce and Marion (nee Campbell) West of Lethbridge. Russell’s grandchildren, great grandchildren and great great grandchildren were precious to him, and he was loved dearly by them. He was predeceased by his parents Curtis and Iona (nee Larson) West of Raymond and other siblings. Russell’s life was well and truly lived. He loved his family and, throughout their lives, made sure they knew it always. He was a true friend who honoured and valued his friendships and was always kind and charitable to others. Russell served his country in World War II and it was while posted in England that he met and married the love of his life, Hazel. Together they worked tirelessly and faithfully to raise their children, create wonderful lives for them and contribute to their community. Russell had many interests: he excelled in sports (basketball, baseball, golf) and loved the outdoors, enjoying many years of fishing and hunting with family and friends. He was a true Alberta son and had a particular love for Waterton and the Rockies. If friends so desire, memorial tributes in memory of Russell, may be made directly to the Taber Royal Canadian Legion Branch No. 20, 5205 – 48 Avenue, Taber, Alberta T1G 1S8 or to The Good Samaritan Society, Linden View, 4700 – 64 Avenue, Taber, Alberta T1G 0C6. Arrangements in care of Southland Funeral Chapel, Taber. Telephone: (403) 223-8778.